MOSCOW, November 2. /TASS/. Russia has made a conclusion after studying a report by the Organization for the Prohibition of Chemical Weapons (OPCW) that chemical agents technically could not be used from a Su-22 plane of Syria’s Air Force, a Russian Defense Ministry official said at a joint news briefing by Russia’s Foreign Ministry, Defense Ministry and Industry and Trade Ministry in Moscow on Thursday. "After studying the materials submitted, I see several aspects that do not allow making a conclusion that chemical weapons in the form of an air bomb were used from a Su-22 aircraft of the Syrian Air Force," the spokesman said at a joint briefing of Russia’s Foreign, Defense and Industry and Trade Ministries. The chemical bomb exploded in Khan Shaykhun went off on the surface, which is clearly indicated by the shape of the crater left on the asphalt road, the spokesman for the Defense Ministry said. He pointed out that the crater in Khan Shaykhun was rectangular, while an airdrop bomb would have left an elliptical or round hole. Also, the asphalt on the site of the explosion had been pressed inside the crater. "This evidence is convincing enough to conclude that at the moment of the explosion the bomb was static and lying on the asphalt surface," he said. A munition on a photo from a report by the OPCW on the incident in Syria’s Khan Shaykhun was an improvised charge made of a water-supply pipe, according to the spokesman. "All aviation bombs are made of highly alloyed steel, which bursts into small fragments when an explosive is detonated inside the bomb. On this photo, they show us as the bomb remainder an incomprehensive metal sheet that has typical folds and ruptures, which suggests that the metal is quite plastic and this is evidence that the munition was an improvised charge made of a water-supply pipe," the spokesman said. 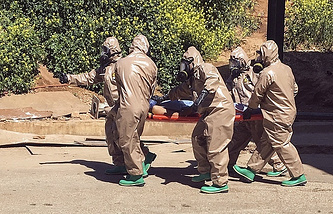 The incident in the town of Khan Shaykhun located in Syria’s Idlib Governorate occurred on April 4 and is supposed to have involved chemical weapons. Almost 100 people died there. According to the Russian Defense Ministry, Syria’s aviation conducted airstrikes over the militants’ workshops where poisoning substances were produced. Washington accused Damascus of carrying out a chemical attack, after which the United States launched a missile strike over a Syrian military airfield in the Homs Governorate overnight into April 7. On October 26, the OPCW-UN Joint Investigative Mechanism issued a report in which it pinned the blame for the Khan Shaykhun incident on Syrian authorities. On October 31, the Russian side submitted the results of preliminary assessment of the report prepared by investigators to the UN Security Council and the UN General Assembly, stating that it is "amateur" and the findings contained in it are based on "dilettante methodology."